There is a growing demand for coconut water abroad. Here in the home front, several businesses are also rooting for this growing industry, including this one---Coco Fresco. Well said, coming from Tamlin Manaloto, the founder of Coco Fresco, a 22-kiosk coconut beverage business that started in 2010. Soon after learning about the high demand for buko juice, Manaloto marshaled about P350,000 and in less than two months put up Coco Fresco. “My mom and I found coconut suppliers and the necessary equipment and machinery while a graphic artist friend, Ina Lacson, helped with the logo, colors, and cart layout,” recalls Manaloto. The first Coco Fresco cart officially launched at the SM City in Clark, Pampanga in August 2010. Coco Fresco targets people of all ages ("from students to senior citizens”), as well as health-conscious customers. “Filipinos want two things in a beverage or food product: delicious taste and low price. So I created variants that would fit both those criteria,” says Manaloto. Coco Fresca currently offers two varieties of beverage: 100% Coco Water and Coco Shake, a blended drink made of coconut water, milk, sugar and ice. 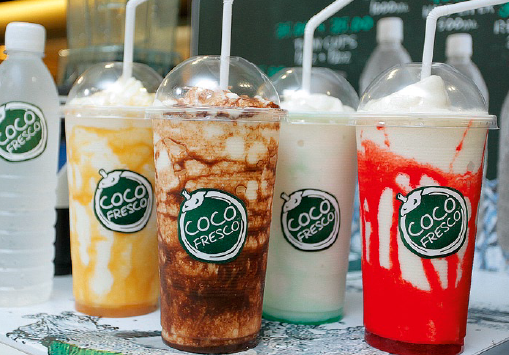 The uniqueness of the Coco Fresco shake lies in its different syrups—caramel, chocolate, pandan, strawberry, and ube—giving it an unusually colorful appeal. The menu currently lists Coco Water in 500ml and one-liter sizes, and Coco Shake in 12 oz., 16 oz., and 22 oz. sealed cups, ranging from P35 to P70 each. This first-time entrepreneur still has her sights set on bigger things for Coco Fresco. With branches already located nationwide, mostly within SM malls, Manaloto sees her company spreading across the Philippines and possibly franchising abroad. This article was originally published in the April 2012 issue of Entrepreneur magazine (with updates from the editor). Subscribe to the print or digital version here.